< Previous Video : Double Window Shaker – By Request! Next > Ellie is Creating a Scene! Gorgeous – great idea and beautifully executed Therese. So that’s how to keep it straight! =] I’m loving that lesson, and the results are spectacular, Therese!! Will be CASEing, for sure! 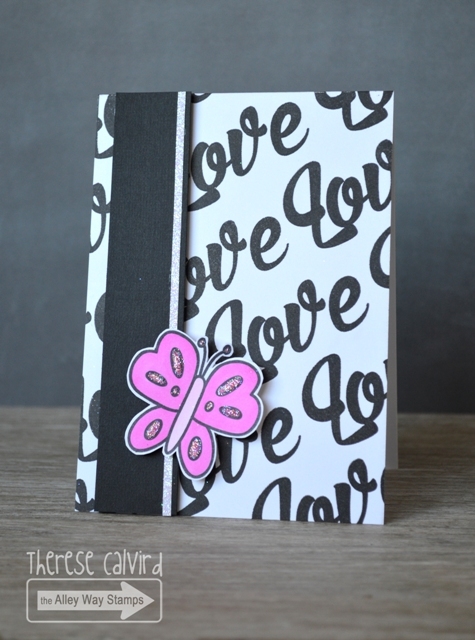 Love the bold background and that gorgeous pop of pink butterfly, Therese! Perfect, my friend! Hi Therese, I love that love card background. Do you use versa fine onyx black when you emboss with black embossing powder? Sometimes I find it messy and was wondering if there was anything else other than the clear. Great background stamping. Gorgeous card. What colour would you do if you didn’t do black? I do like the black. Hi Vicki, I think this background would have also been nice in silver, but you could even do it multi-coloured! Have a great day! Gorgeous card, Therese! Thanks for showing us how to line it up 🙂 I love the font on the sentiment, and your pretty pink butterfly is the perfect touch! You did it again Therese, a STUNNING card, It is perfect with the colors and the touch of glitter. Love what you are saying about having that fine glitter all over the place for a few days. My son often says “mom you have glitter in your face AGAIN” haha. Hope you have a lovely day and thanks for the inspiration. Brilliant background idea and one I think I might have to try out. I even have a stamp in mind…..you always leave me with ideas on how to use my stamps differently, I really appreciate that! 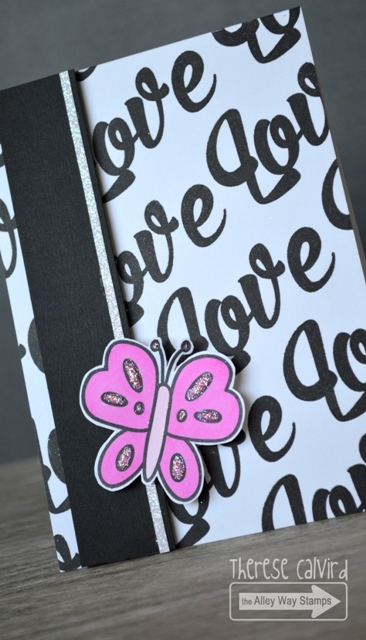 Wow, I love that black and white bold background with a pop of pink on the butterfly!! I watched this video a while back with my girl. Couldn’t comment then. I admired your ability to get it so straight… it looked so simple although it is so hard. Thanks for the tips and tricks and the inspiration, I need to try this on my own. The bold pink butterfly looks amazing against your dark background.